Some of the world’s top news organizations were barred from the biggest event in China’s political calendar on Wednesday. Outlets including the The New York Times and the BBC say they were excluded from the eagerly awaited unveiling of the elite group of leaders who — alongside President Xi Jinping — will rule the world’s most populous country for the next five years. 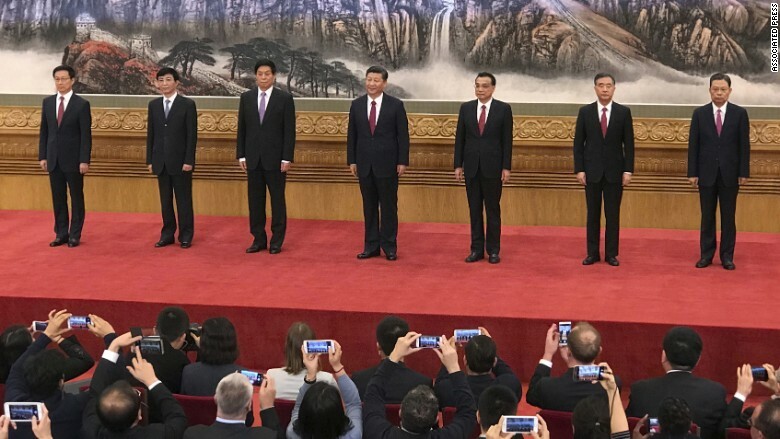 The Financial Times, the Economist and the Guardian were also prevented from attending the event, where Xi made remarks to the news media, according to a statement from the Foreign Correspondents’ Club of China (FCCC). “The press conference is a high profile news event involving China’s top leadership and it is hard to avoid the conclusion that these media organizations have been singled out to send a message,” the Beijing-based group said in a statement. Chinese officials didn’t give an explanation for the decision, according to the Guardian’s report on the issue. A spokesman for the press center of the 19th Communist Party National Congress, which organized the event, told CNN he didn’t know how attending media were selected, adding that some news organizations were not invited. CNN was invited and able to attend. The Foreign Correspondents Club expressed concern about the selective access to the event. “Using media access as a tool to punish journalists whose coverage the Chinese authorities disapprove of is a gross violation of the principles of press freedom,” it said. President Xi Jinping (center) revealed China’s new leadership team, tightening grip on power. It wouldn’t be the first time Beijing has employed such methods. In late 2013, Chinese authorities held up renewing the press credentials of roughly two dozen Bloomberg and New York Times reporters after the two news organizations published bombshell reports on the wealth of family members of top Chinese leaders. CNNMoney reached out to the news organizations who were prevented from attending Wednesday’s event. The New York Times, the BBC, the Guardian and the Financial Times declined to comment beyond the FCCC statement. The Economist said it applied for two invitations to the event “in the normal way” but never received them. Even foreign journalists who were granted access to the event found themselves reined in by certain restrictions. Cell phones were unable to receive a useable signal in the room where the event took place. Foreign journalists were also given no access to the internet, while some Chinese state media had dedicated internet lines. China has a long history of censoring news coverage it deems sensitive or destabilizing. CNN’s TV coverage of this week’s Communist Party National Congress was regularly blacked out, as were similar broadcasts from other networks. The New York Times’ English and Chinese websites have been blocked in mainland China since 2012. The Financial Times’ Chinese site was blocked earlier this year. Officials have also occasionally blocked the websites of other news organizations, including the Economist, the Guardian and the BBC. Xi also made tightening the ruling Communist Party’s control of domestic media a key part of his first five years in power, demanding greater loyalty from state outlets. Previous articleWhat's wrong with Japan Inc?